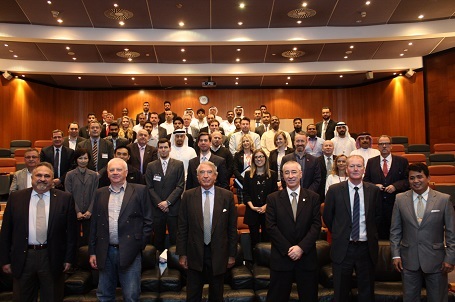 Dubai, UAE, 25 – 27 February 2017: Emirates Group Security (EGS) organised a three days of interactive sessions at the Crisis management & Media response Workshops at the Emirates Aviation College. The one-day Crisis management workshop was graced by highly-qualified Speakers who explicated in depth various topics in their expertise field such as European Response to Emerging Threats, The Human Factor in a crisis, Regulatory Perspective from ICAO, A Pilot Survivor’s Perspective (the Singapore Airlines Flight 006 Experience), Contingency Response Planning (an aircraft accident – how prepared are you?) and Special Forces Intervention. Delegates gathered knowledge from people who have experienced real-life incidents; including hijacks and aviation accidents. Delegates participated in a live hijack exercise in the emergency evacuation simulator. The exercise is designed to provide the attendees with a simulated experience as to demonstrate the stages of a hijack situation and the role of Special Forces in neutralising a hijack. The workshop provided delegates with concrete crisis management solutions and strategies while giving insight into the delivery of effective crisis command, control and communication. We’ve also introduced a new two-day Media Response Workshop, where you can learn how to approach TV interviews, social media and more, following an incident. Your media response is an integral part of your crisis management plan. In this practical two-day event, the attendees were put through their paces in managing media communications in a crisis.